[prMac.com] Vancouver, Canada - InfoLogic is proud to announce MathMagic 6.0 Series, their award-winning professional level equation editing suite for Mac OS X. With a focus on ease-of-use and high quality output, MathMagic is a multi-purpose equation editor for any mathematical equations and symbols. 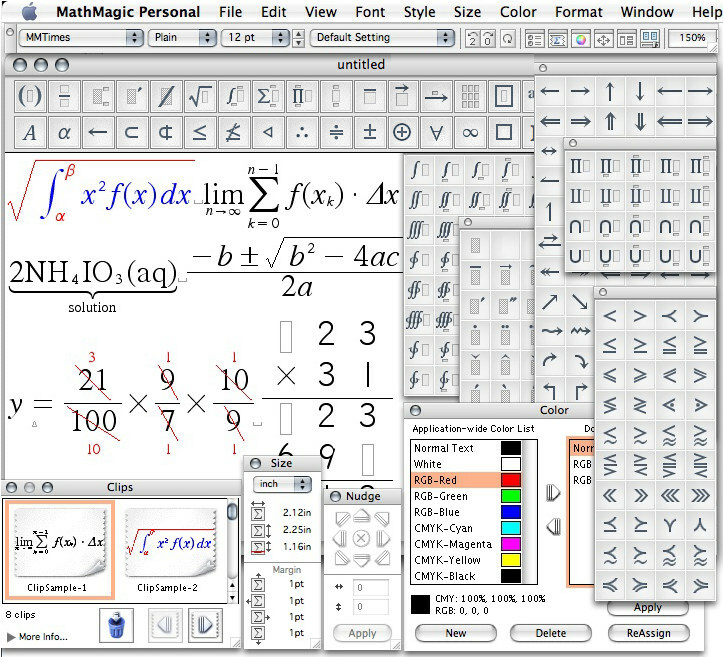 MathMagic Personal Edition is available as a standalone utility for use with any word processing, presentation, or graphic application, including iWork, AppleWorks, Microsoft Word, Keynote or PowerPoint. Equations created with Personal Edition can be used by Drag & Drop, Copy & Paste, or Export/Import. On top of all the features of MathMagic Personal Edition, MathMagic Pro Editions come with additional plug-ins for Adobe InDesign or XTensions for QuarkXPress to improve the quality of equations and productivity in inserting or editing equations in InDesign or QuarkXPress documents. First available on Mac for QuarkXPress in 1988, MathMagic's equation quality is unsurpassed and designed to meet stringent high-end DTP requirements. MathMagic Pro Editions allow graphic designers to write, edit and save equations directly in InDesign or QuarkXPress documents without going through a export/import step. Individual MathMagic installers for version 6.0 are immediately available for download for trial and registered users. MathMagic Personal Edition starts from $29.95 USD. Pro Editions start from $199.00 USD. Both Personal and Pro Editions are also available as one month licenses, $10.00 and $50.00 USD respectively. Full licenses include a 2-year free upgrade. All MathMagic installers come with a fully functional trial period. Headquartered in Seoul, Korea, InfoLogic, Inc. was founded in 1996 by Charlie Lee, with its North America office in Vancouver, Canada. InfoLogic specializes in technical and desktop publishing (DTP), high quality digital contents, and Macintosh software development. Released in 1998, MathMagic is its flagship product. InfoLogic also ported ThinkFree Office to the Mac OS platform and released several utilities and XTensions products. Its copy protection solution for OpenType and TrueType fonts has been adopted by several major 2-byte font vendors in Asia. Copyright 1996-2009 InfoLogic, Inc. All Rights Reserved. MathMagic, MathMagic Pro Edition, MathMagic Personal Edition, MathMagic Prime Edition, MathMagic XTensions, MathMagic logo, and InfoLogic are trademarks or registered trademarks of InfoLogic, Inc. All other trademarks are the property of their respective owners.